We're getting ready to identify our next neighborhoods for Gigabit fiber expansion. If you live in Blacksburg or Christiansburg, fill out the survey (the link is on the home page) and let us know. Tell your neighbors, too--we are looking for neighborhoods with a high interest in getting connected. Read more about Who wants Gigabit fiber? Our first two neighborhoods are now online with super-fast fiber connections. Residents are paying $69.95/month for a Gigabit fiber connection and a 100 Meg down/100 Meg up Internet service. We are now going to be looking for more neighborhoods in Blacksburg to bring the world's best Internet service. Follow the link on our home page to fill out the "I want fiber" interest form. We'll be bringing fiber to the neighborhoods with the highest response rate to our form, so tell your neighbors to fill out the form too. If you live in Haymarket Square and would like to have faster, better Internet, fill out our survey (see the link on our home page) and let us know--we just added your neighborhood. We are completing the final equipment configuration on the network in our first two Blacksburg area neighborhoods today, and expect to start connecting customers with super-fast Internet in the next couple of days. We will be using data from our survey (have you filled it out to let us know you want Gig fiber?) to identify where to build next. 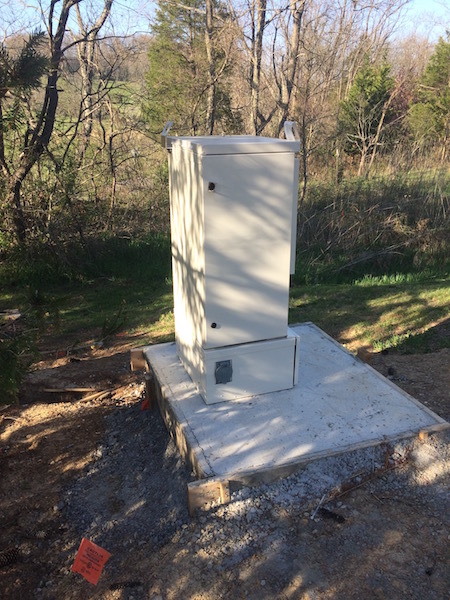 The picture below shows the first fiber to the home cabinet in the New River Valley. Read more about Gigabit fiber is here! One of the most common questions we get is, "Why do I want fiber?" We've created a one page handout that may help answer that question. You can download it by clicking on the PDF icon. Work from home--full time, part time, or nights/weekends. We give you the freedom to choose! Run a business from home, or run a server from home. Connect more TVs, laptops, computers, tablets, printers, and servers and have them all work at the speed of light! Use all the bandwidth you want without worrying about slowdowns, overage charges, or data caps. Watch TV, movies, sports,and video at the highest possible quality--a better entertainment experience! Put home security cameras around your house and get notifications, live HD video, and sound right on your tablet or smartphone, wherever you are. Connect to the Virginia Tech network or your company VPN as if you were sitting in your office at work. Make full use of cloud services at blazing fast speed. Seamlessly connect multiple business locations and offices. Home-based employees can fully participate because videoconferencing works like it is supposed to with no stuttering, drop outs, or screen slowdowns. Get an inexpensive home phone line that actually provides a high quality connection without annoying drops. Fiber makes back up services like Carbonite, Amazon, and Mozy work the way they are supposed to with no waiting. Click here to download a handout explaining the strengths of fiber. Read more about Why fiber? Some of you noticed our Web site went down over the weekend....it was a minor server burp that took the site off line temporarily. We got it straightened out Sunday evening. Thanks to all who were checking in! Read more about Server burp! Fiber adds resale value to your home. A $3500 investment in fiber can increase your property value by more than $6,000--a 180% return on your investment! Fiber is the best home improvement you can make, as it is the only type of improvement that adds more value than what you spent. Typical upgrades like a remodeled master bath, granite countertops, or a new deck will add less that you spent. 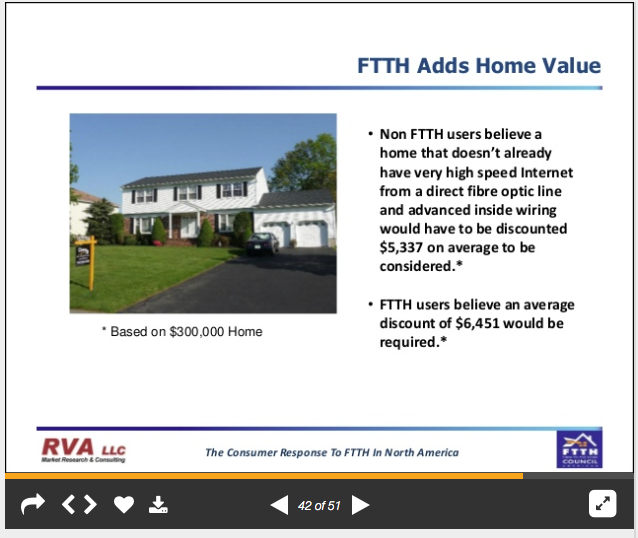 Attached is a screen shot from a Render Associates nationwide study on fiber, and here is the link to the presentation with all the data. Here is another summary of a 2014 study on fiber value. Here is a report on typical home improvements and estimates of your likely return...typically 60% to 90%. Read more about Fiber adds value to your home! The Roanoke Times wrote a nice article about us on Sunday. You can find it here. Here is an interesting video that really gives an excellent view of what kind of technology is coming to homes and businesses.....and helps show why high performance fiber connections are going to be important. Read more about What about TV?